The historical, cultural, and commercial center of Uptown is Broadway, with Uptown Square at the center. In 1900, the Northwestern Elevated Railroad constructed its terminal near Montrose and Broadway. Uptown became a summer resort town for downtown dwellers, and derived its name from the Uptown Store, which was the commercial center for the community. For a time, all northbound trains from downtown ended in Uptown. From here Uptown became known as an entertainment destination. Charlie Chaplin, Gloria Swanson and other early film stars produced films at the Essanay Studios on Argyle Street. 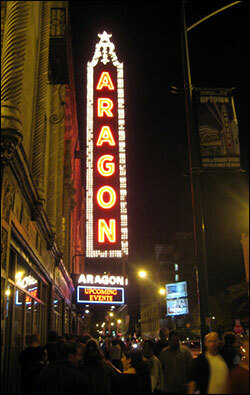 The Aragon Ballroom, Riviera Theater, Uptown Theatre, and Green Mill Jazz Club are all located within a half block of Lawrence and Broadway. Uptown is also home to one of Chicago’s most celebrated final resting spots, Graceland Cemetery. Buena Park is a neighborhood bounded by Montrose Avenue, Irving Park Road, Graceland Cemetery and Lake Shore Drive. At the core of the neighborhood is the Hutchinson Street Historic District, a tree-lined stretch several blocks long featuring mansions that make up “one of the best collections of Prairie-style architecture in the city.” It is in sharp contrast to the skyscrapers that populate the area around it. It can be accessed from the Sheridan stop on the CTA’s Red Line. Robert A. Waller developed Buena Park starting in 1887 by subdividing his property. The site of the original Waller home now holds St. Mary of the Lake church. Buena Park pre-dates the remainder of Uptown by a number of years. Buena Park is also home to one of the most active neighborhood organizations in Chicago: Buena Park Neighbors. (Known as) the Waller lot. This neighborhood is mostly populated by residents who had Vietnamese and Cambodian nationality. However, many, if not most, were from ethnic Chinese minorities and, for that reason, became refugees during the Sino-Vietnamese War of the late 1970s. In the span of a few city blocks, Little Vietnam boasts half a dozen Asian grocery stores as well as more than a dozen Vietnamese, Thai, Laotian, and Chinese restaurants. The neighborhood should not be confused with Old Chinatown, which is in the Armour Square community area on the South Side of the city. A noteworthy minority within a minority on Argyle are the Bui Doi, those of mixed Vietnamese and American ancestry. Children of mixed unions had often suffered from discrimination in Vietnam, partly because of hostility to the US armed forces and partly because the women (the unions were almost always of Vietnamese women and American men) were seen as prostitutes. The most discriminated against were those of African American-Vietnamese parents. Uptown was a welcome relief for those who struggled with this oppression. The neighborhood is centered by the Argyle stop on the CTA’s Red Line. Margate Park forms the eastern border of Uptown and Edgewater, nested between the recently revitalized strip of new construction on Sheridan Rd. and the pleasantries of the Lincoln Park northern reaches. Its tree-lined streets, historic mansions, and gilded mid-rises reflect the area’s development in the bustle of Uptown Chicago’s burgeoning entertainment industry in the early 1900s. The diverse housing also includes ornate, terra-cotta clad hotels, immortalized in movies as Chicago Gangster Era apartment hotels. Some of these 1920s Jazz Age hotels have been since been converted to SROs in the area to provide transitional and supportive housing, adding to the tremendously diverse population of the area. This lakefront neighborhood is home to Margate Fieldhouse, a gym and fitness facility. The area around the fieldhouse is an official off-leash area in the city for dogs. Annual city permits are required for dogs using the areas. The fieldhouse is also host to the Margate Playground, with 1,400 square feet of playspace for children. Artists Jim Brenner, Corinne D. Peterson, Ginny Sykes, and Roman Villareal created a unique space reflecting the urban locale catering to children’s interests and local fauna. This area of Uptown has been identified as many different names over the years. Its borders are Lawrence to the south, Broadway to the East, Clark to the west, and Foster to the north. Andersonville Terrace, or SOFO (South of Foster) are names often given to the area by those who wish to identify more closely with the part of the neighborhood that borders Andersonville. The area itself is rich in Uptown history. Major landmarks include Essanay Studios, best known today for its series of Charlie Chaplin comedies filmed in 1915, and the Green Mill Cocktail Lounge, a historic jazz lounge that once belonged to member of Al Capone’s Chicago Outfit. North of the Green Mill along Broadway, notable buildings include the classic ornate movie palace, the Uptown Theater, and a 1930s US Post Office containing two murals by American architect and muralist Henry Varnum Poor. Uptown is well-served by multiple stops on the CTA’s Red Line, with connecting bus lines at each.